Sid Webb is an artist who moves in many directions. He pioneered the use of digital design and graphics with Kentucky Educational Television, is an accomplished photographer, and knows his way around a paintbrush. Much of his photography is fairly straightforward and observational, but this image of Porta, Portugal bridges the mediums with the precision of a photograph joined with the color and surface textures of a painting. 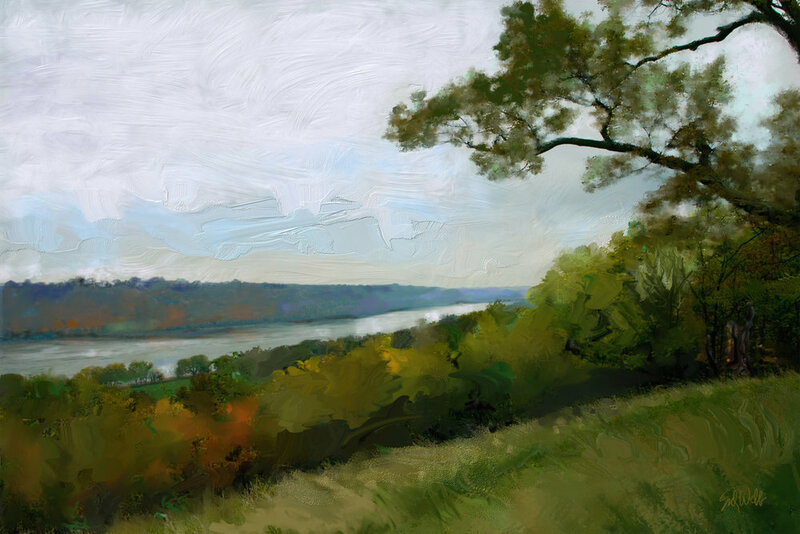 In the two oil paintings shown, Webb injects fresh perspective into commonplace settings along the Ohio River by emphasizing their intimacy. Instead of a grand view of the landscape, the point-of-view is from the ground, and there is a distinct sense of people in residence along the river – those two Adirondack chairs indicate privileged moments shared over a lifetime. It feels like a community separate from the defining civic boundaries of city and county. The geography, the elements, and the flow of the water shape life here. Webb’s mark making is disciplined yet spontaneous. The brushwork communicates the action of painting: the loose yet intentional movement of the brush and the connection between what the eye observes and what the hand will render. The light is subdued, diffuse, an overcast day in the dog days of summer before the leaves begin to turn. On September 29, Webb will be part of the Louisville Visual Art’s Juried Exhibit in the 2018 Portland Art & Heritage Fair. The exhibit will be available for viewing at the Marine Hospital from 11am-5pm. Jury prizes will be awarded at 2:00pm. Tags: kentucky educational television network, Ohio River, 2018 Portland Art & Heritage Fair.